Improve skin quality and appearance without the downtime associated with a surgical procedure! 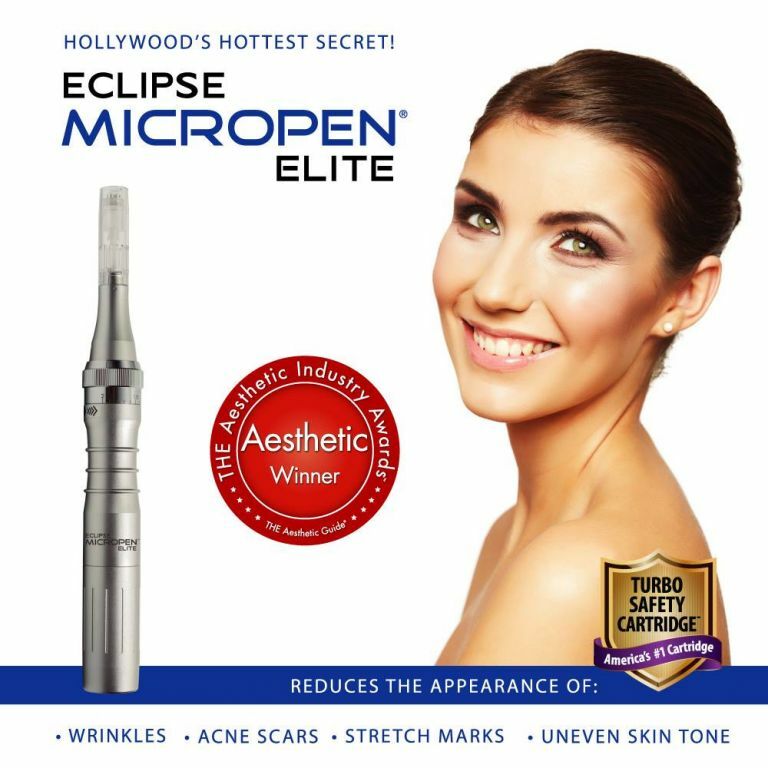 The Eclipse MicroPen™ Elite is an innovative technology designed to improve skin quality and appearance without the downtime associated with a surgical procedure. In combination with PRP (platelet-rich-plasma) therapy, this micro-needling technique can reduce the appearance of many common signs of aging as well as other imperfections on the face, neck, and body. Furthermore, treatment time is often brief, and patients should be able to return to normal activity soon after the procedure. Another benefit of the Eclipse MicroPen™ Elite is the brief procedure time, which can be completed in as little as 15 minutes, depending on the size and number of treatment areas. Furthermore, most patients report little discomfort, describing the sensation as feeling similar to having sandpaper brush against the skin. A numbing solution can be applied to make your experience as pleasant and comfortable as possible. Some mild redness, tenderness, and swelling in the treated area is normal, and these effects should fade over the course of a few days. Makeup can be worn to cover these symptoms if desired. Depending on your customized treatment plan, one or more sessions may be recommended to optimize your results. For more information about the Eclipse MicroPen™ Elite and PRP therapy, or if you would like to schedule a consultation, please contact us today. Or, give us a call at (702) 450-0777. Micro-needling with Platelet Rich Plasma (PRP) therapy, also known as the Vampire Facial ®, is an advanced skin rejuvenation technique that uses a patient’s own blood plasma to revitalize the skin. Our nurse will draw a small amount of your blood and place the sample into a centrifuge that separates the red blood cells from the valuable plasma serum, rich in platelets. Once this serum is prepared, it is applied topically to the skin. It is then used in conjunction with Micro-needling, in a process that involves penetrating the skin with tiny needles to stimulate collagen production. Why should I choose the PRP facial? This treatment is a combination of two complementary techniques. The Eclipse MicroPen™ Elite performs automated micro-needling to create tiny, precise channels in the skin. The body then responds to these micro-injuries by stimulating collagen and elastin production and generating newer, younger skin cells. While this method can be effective alone, adding PRP therapy can further enhance the cosmetic benefits. PRP will be collected prior to beginning the micro-needling treatment by harvesting a small volume of your blood and removing the red blood cells. The remaining fluid is called plasma, and this serum is naturally filled with growth factors known for repairing soft tissue and encouraging skin rejuvenation. PRP will be applied topically to the treatment area before and after micro-needling.